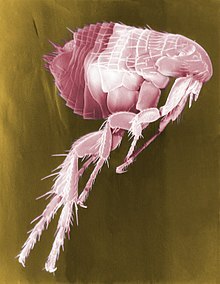 False colors scanning electron micrograph of a flea. From Middle English fle, from Old English flēah, flēa, from Proto-Germanic *flauhaz (compare West Frisian flie, Low German Flo, Flö, Dutch vlo, German Floh, Icelandic fló), from pre-Germanic *plóukos, *plówkos, from Proto-Indo-European *plúsis (compare Latin pulex, Sanskrit प्लुषि (plúṣi)). A small, wingless, parasitic insect of the order Siphonaptera, renowned for its bloodsucking habits and jumping abilities. A thing of no significance. In this Thwackum had the advantage; for while Square could only scarify the poor lad's reputation, he could flea his skin [...]. This page was last edited on 18 April 2019, at 00:40.